The Fitzgerald-class Algosteel freighter is here in Z Scale! I’ve decided to go ahead with this model, and make improvements over time. 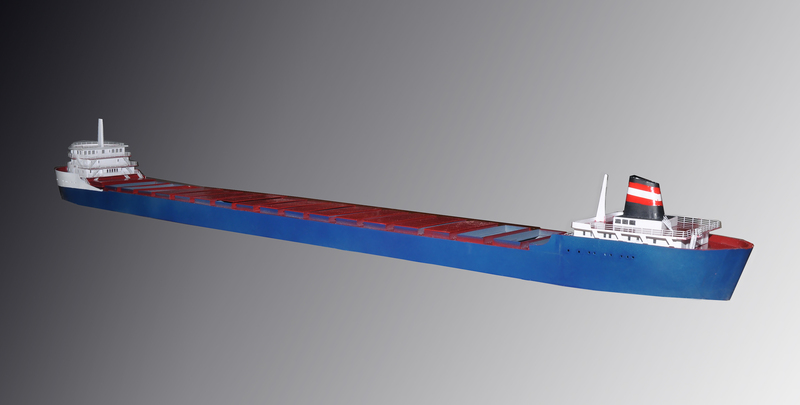 This model represents the Algosteel Great Lakes freighter as it was before 1990, when a self unloader was added. The Fitzgerald class was 730′ in length, 75′ in beam, with a draught of about 27′, and a capacity of about 27,000 tons. Many of these ships are still operating. A feature missing from this prototype is the hatch lifter, which will be adapted and improved from my N Scale Lakers. The self unloader is a project for my Alabama winter stay in 2014-2015. 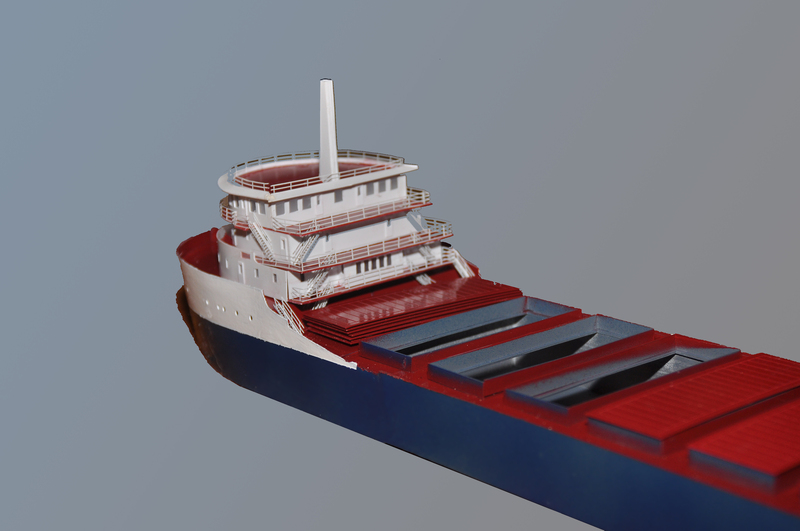 Here’s a good port-side view of the prototype model. 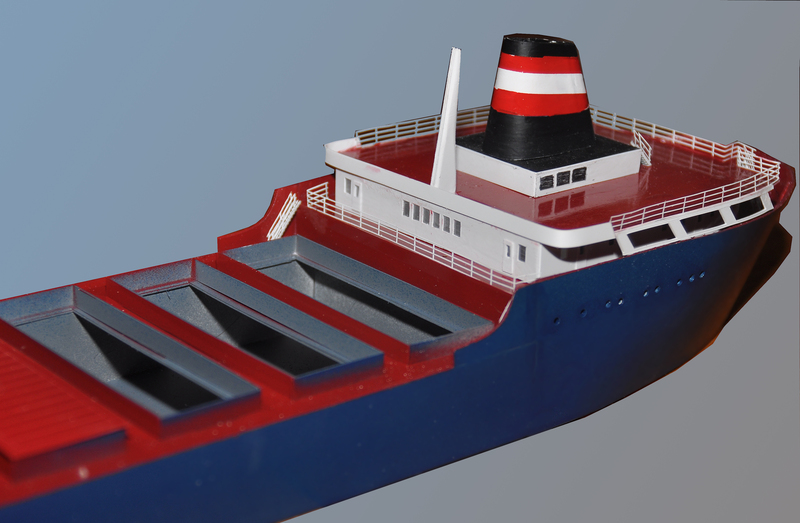 The model has all the features you’d expect from N Scale Ships, only this time in Z Scale: custom Z Scale railings and stairways, precision cut styrene, cast resin stack and lifeboats, finely ribbed coamings, custom-built winches and windlass, and accurate details throughout. Here’s the bow house. All of the hatches are removable, showing the six holds. The owner and guest lodgings on the forecastle decks are accurate, and the navigating bridge could be detailed. The stern house is equally accurate and detailed. The prototype was photographered before the exact location of tanks, vents, lifeboats and other poop deck details were determined, but these will follow our customary detailing practices. The basic styrene kit, which includes hull, superstructure, cast resin parts and non-brass details, is $275. The photoetched brass detailing kit, which includes about a half mile of railing, is $150. A built-up model is about $2350., depending on custom details and decals. These are preliminary prices and may change. The kit is fairly easy to build (it is a simple hull), but does have many repetitive parts, and is quite large.